Apple has posted this year's WWDC 2010 keynote delivered by co-founder, Steve Jobs. 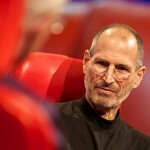 Watch Apple CEO Steve Jobs introduce the new iPhone 4. See the video-on-demand event right here, exclusively in QuickTime and MPEG-4. You can stream the keynote address directly from the Apple website, or you can download the entire video in iTunes via Apple's keynote podcast feed and watch it on your favorite Mac, PC, iPod touch, iPhone, iPad, or my personal favorite, Apple TV + 42-inch TV.